Since there has been some buzz on Coherent, I thought I’d see what the state of emulation is in 2015.. .While Qemu 1.2.0 can install Coherent, the hard disk access is incredibly slow. Luckily for me, I was basically stuck on hold, and bouncing between tasks so the four hour long install didn’t seem so bad. Unimplemented transfer 0x31 on Bochs. The first thing I tried to do was to get it to run on Bochs. This was somewhat as easy as mounting the disk, and setting the hard disk to bootable in the Bochs setup program. 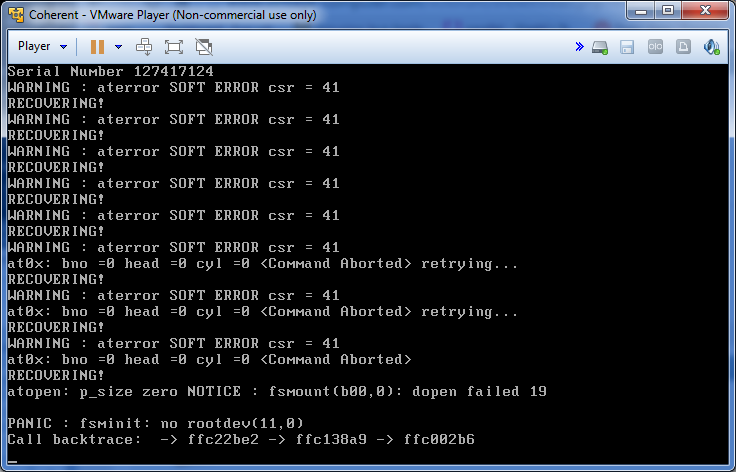 Coherent boots up, and then starts to print errors that it’s unable to write to the disk. 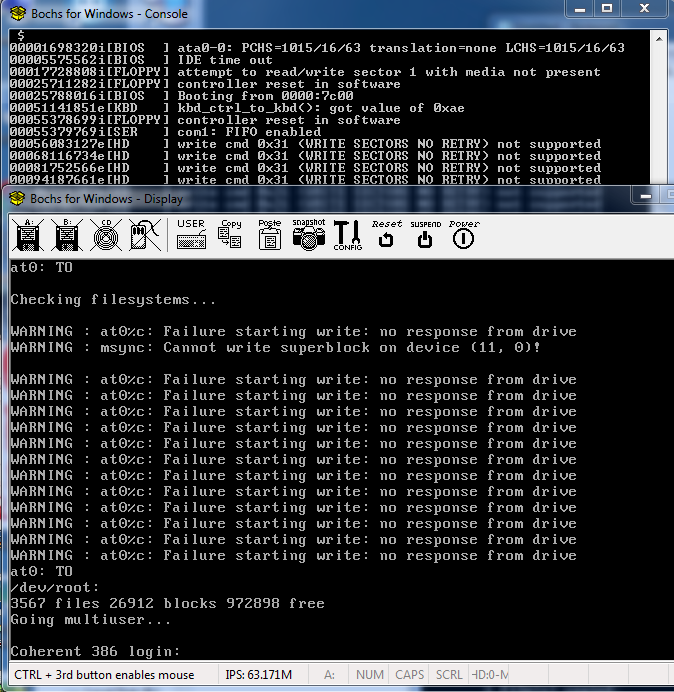 So, the CPU seems to work, but without the ability to write to the disk, it isn’t too useful. 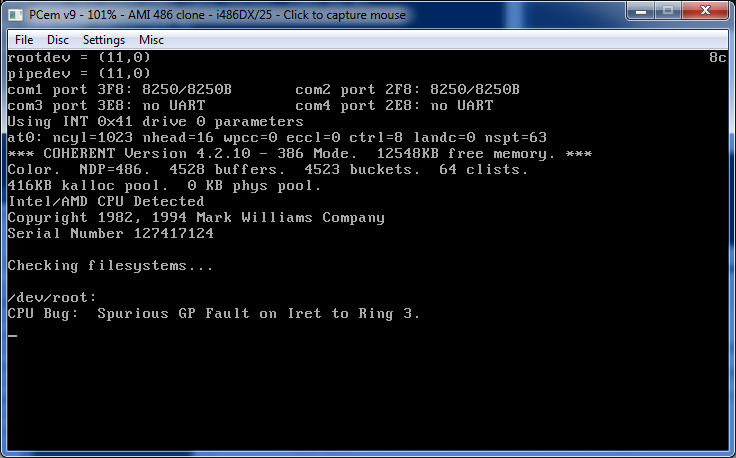 PCem Spurious GP Fault on iret to Ring 3. Which is a shame, as I thought that PCem would probably handle any sensitive timing issues the best. Next up, I tried VMware Player. Which had issues with the hard disk. Next I thought MESS may actually be able to run it. It boots, it seemingly doesn’t crash, but it just hangs there. I assume it’s also plagued by the insanely slow hard disk access that Qemu struggles with. I don’t know if this counts for close. But this is the current state of emulation. 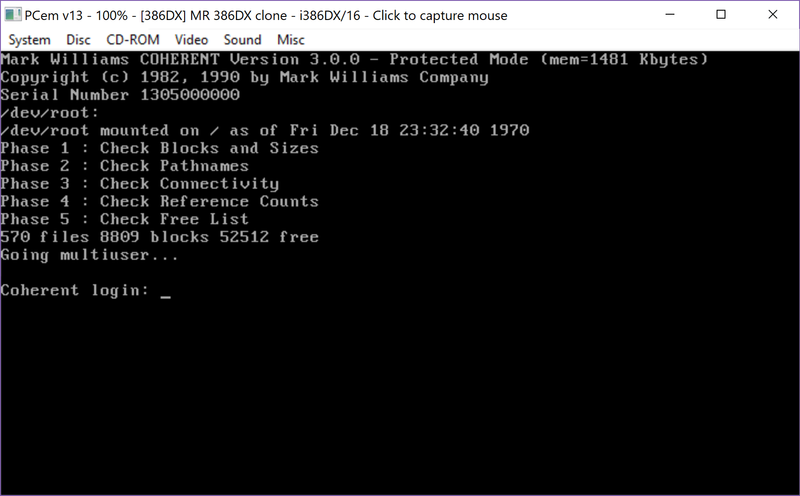 So it’s great that there is source, although it looks like it’s several internal branches of the PC branch (the source only mentions the PDP11, 68000 and Z8001 ports in libc), but there is a bunch of RCS files. Its more so a matter of going through all of that to parse out project tree’s and see which ones are newer. Not all parts have RCS files though, the userland is just a straight source dump. I’d suspect the only viable way to get this running on modern emulation is to really get it either cross compiling, which means building it’s toolchain, and trying to build a new kernel or finding old enough hardware to build on. I can’t even begin to imagine trying to use a compiler on a disk that functions at 1kb/sec. 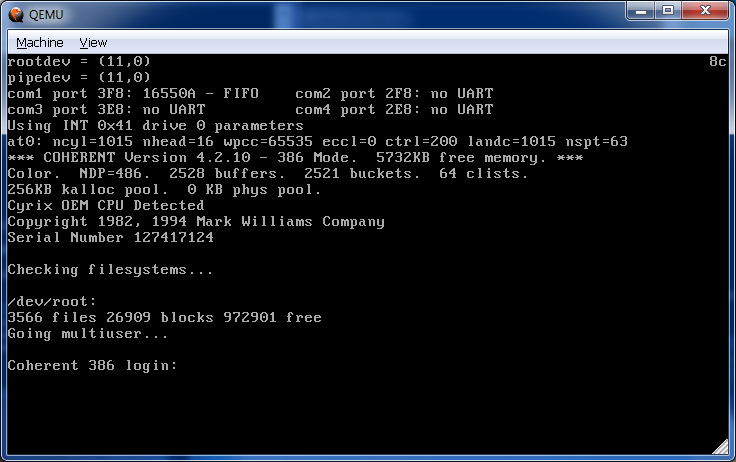 Well I thought I’d go ahead and try a newer version of Qemu for Windows, namely the 20141210 build, and here we go! 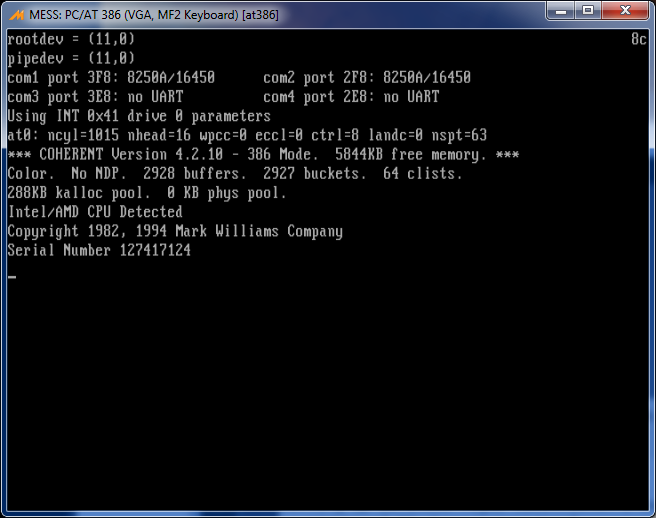 Although I don’t know if you need to reduce the CPU or limit the RAM (remember Coherent can’t swap!). Maybe now is a good time to read that manual. 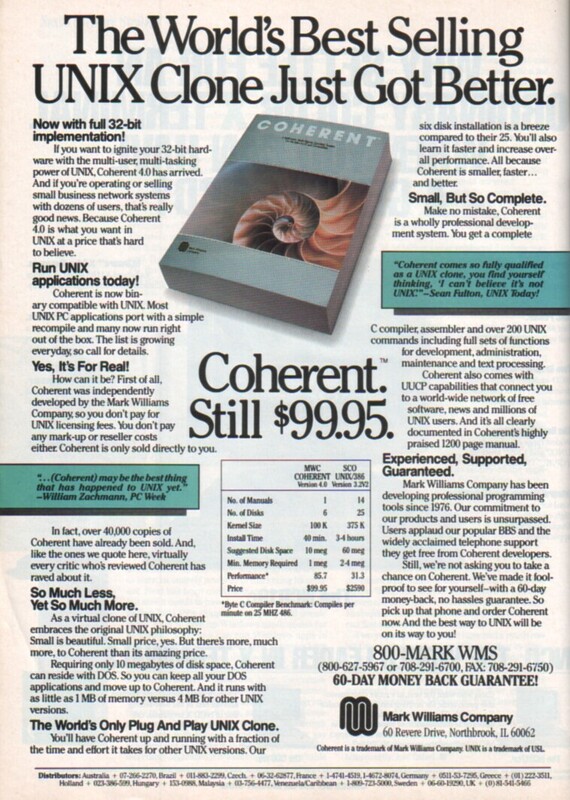 So Coherent was free to continue to sell their discount Unix like OS for the bargain price of $99 USD. I had plans on buying a copy as the older versions even supported the 8086, and 80286 however by the time I finally got enough RAM and disk space to make the purchase worth while, Linux was freely available. I believe that Coherent was the first OS to be killed by the Linux juggernaut, followed by SCO Xenix. So it’s a little late to the party, open sourcing may have helped back in the early 1990’s although it’d seem like an utterly crazy move at the time. Better late than never, this includes source dumps, and some RCS data, along with random tgz’s and a binary distribution of version 4. Without any doubt this will either help emulators better emulate the machine state Coherent expects, or perhaps fixing Coherent to run on more modern machines. 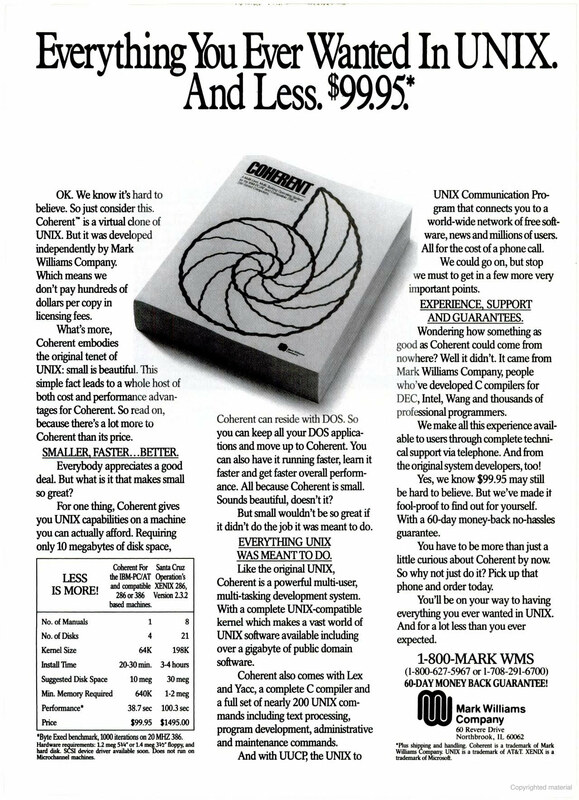 Coherent was also famous for it’s large, and well documented manual. Luckily the sources to the manual are also available. So without further ado, here is the pages with the sources to coherent. On final note of interest is that the Mark Williams Company was founded by Robert Swartz, who’s son Aaron was quite influential until the time of his death.